Skullgirls is a beautifully animated 2D all female fighting game for PC, PS3 and Xbox 360. The creator of the game Alex Ahad asked me to do a piece for the new in game art gallery for the PC version. 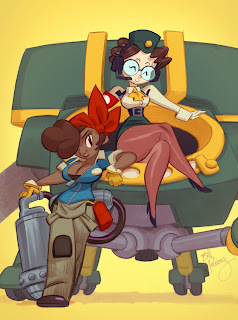 I decided on Molly and Roxie because they were the characters I was rooting for to win the Indiegogo campaign for new characters to be added into the game. Sadly they did not win. Instead, I honor them with this pin-up. If you've got a PC copy of the game check out the new art gallery!